We all have fears. Whether we acknowledge them or not, they exist deep within us. Facing our fears, that’s the challenge. 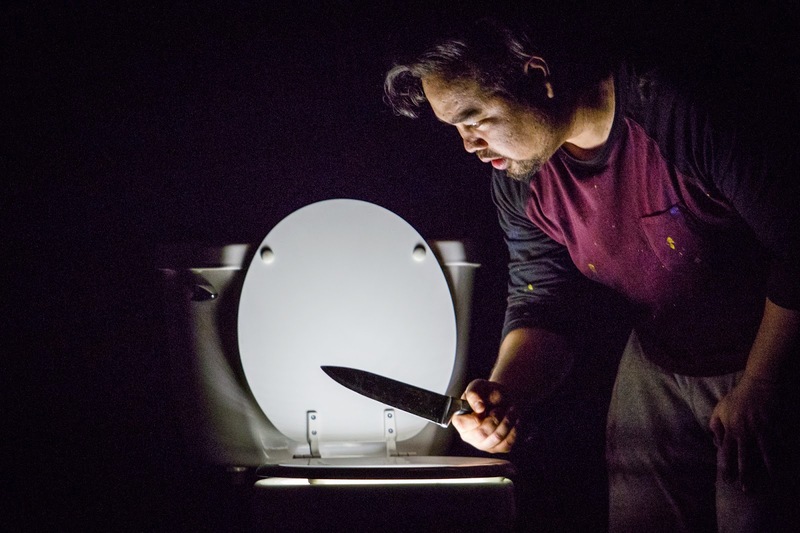 In Cory Finley’s hauntingly electrifying The Feast, an artist’s psyche is put to the test as he’s haunted by the unknown creatures that may live in the pipes in his toilet. Matt, a young artist in New York, finds his life crumbling in front of his eyes as his girlfriend is cheating on him, his career isn’t quite budding, and there are strange noises coming from within his toilet. The Feast is a darkly absurd thriller about fear and the unknown. From scene to scene, Finley gives us clues and hints as to what exactly Matt is or isn’t hearing. On paper, you may laugh at the conceit but Finley knows how to keep the audience engaged and spooked. Sure, there are moments of hilarity, but his play of reality is what keeps the piece moving. Finley layers his script with subtle jabs at art and the fears artists have. The characters that exist in The Feast are quite thin. They fit certain roles and hit certain plot points that are necessary for a thriller. But what The Feast lacks in character substance it greatly makes up for in excitement. What director Courtney Ulrich and Finley do well is keep the fear factor at an extreme. With clever staging techniques at the ready, Ulrich is able to spook and scare with the greatest of ease. Playing Matt, the man with a sense of the unreal is Ivan Dolido. Dolido had an extraordinary task of carrying the weight of the world on his shoulders. Dolido kept up the intrigue as you followed along his bizarre journey. As an assortment of characters that infiltrate Matt’s mind, Donaldo Prescod kept it varied and interesting. From a plumber to psychologist, to the other man, Prescod balanced the real and unreal quite well. As girlfriend Anna, Marlowe Holden was charming. Holden’s Anna was strong and had nice chemistry with Dolido. To create the world, scenic designer Andrew Diaz used every inch of the long space to create an apartment. And Ulrich used it to her advantage. The ambiance crafted by lighting designer Scot Gianelli was eerie, especially as the world become more absurd. When the meaning of the feast is finally revealed, things get weird in all the right ways. Hints at the arrival of the sewer creatures mean the fun is about to begin. Like every thriller, a storm means a blackout and a blackout means impending doom. With the lights out, Ulrich uses some tricks for a wonderful swap-out and a scream-fest final moment. If the goal was to scare the audience in the end, Ulrich and Finley went above and beyond. Playing upon the fears of those sitting in the audience added an incredible aspect to an already exciting night at the theater. I couldn’t help but smile knowing something was coming from the darkness. The Feast is a thriller that lets the absurd excel. For those thrill-seekers out there, this one’s for you. Whether you like it or not, the end will stay with you, perhaps even haunt you for nights to come.